Annemarie K. Harr joined Weiss Burkardt Kramer LLC as an Associate in October of 2015. Her practice of education law is focused on special education and student services. 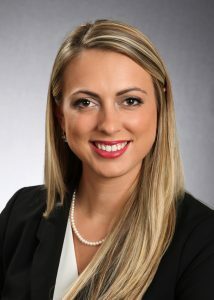 As part of her work, Annemarie has assisted in creating and presenting Professional Development trainings in various school districts, regularly assists school district clients in preparing for Due Process hearings, including exhibit and witness preparation and representation, and has assisted clients with providing access to public documents in accordance with the Right to Know Law, including requests made in conjunction with complex litigation. Before receiving her Juris Doctorate from Duquesne University School of Law in 2015, Annemarie received her Bachelor of Arts degree in English with minors in Theology and Philosophy from St. John’s University, and then went on to receive her Masters of Arts Degree in Theology with a focus in Social Justice. While in law school, Annemarie served as the Executive Editor for Joule: Energy and Environmental Law Journal, was President of the Education Law Society, received a CALI Award for Excellence in the area of Immigration Law, and was an active member of the Law School’s nationally recognized Trial Advocacy Team, competing in Trial Advocacy competitions across the Country. Prior to joining Weiss Burkardt Kramer LLC as a law clerk in 2014, Annemarie interned at KidsVoice, as well as the Education Law Center where she focused her research on issues surrounding school funding, school discipline, the education of students experiencing homelessness and school district compliance with the McKinney-Vento Act, and the education of English Language Learners. Annemarie is admitted to practice in the Courts of the Commonwealth of Pennsylvania and the United States District Court for the Western District of Pennsylvania. She is a member of the Pennsylvania Bar Association, the Allegheny County Bar Association and the Association of Municipal and School Solicitors.